While this scenario may sound like the intro to a bad joke, Rachel Armstrong wants you to imagine a world where lawyers and farmers aren’t such strange bedfellows. In an agricultural sector that rarely goes out of its way to support small and mid-size farmers, attorneys can be strong allies by helping food producers navigate the legal system. These kinds of relationships, Armstrong says, can create the foundation for a healthy network of viable farm businesses for the long-term. Enter Farm Commons, the nonprofit Armstrong started in 2012. The site is a community-driven resource for farmers interested in using the legal system to protect and sustain their businesses. 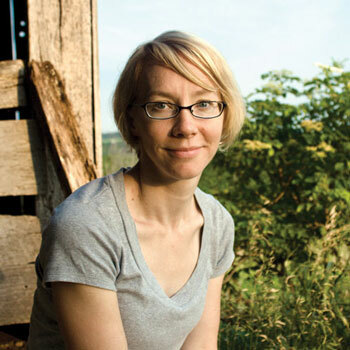 We spoke with Armstrong recently about her story, legal risks on the farm, and how lawyers are crucial in the fight for a fair, just, and healthy food system. You started your career working on farms and community gardens. How did you make the transition into the legal field? I’ve always had a passion for farming and I realized I didn’t want to compromise and do something else because farming isn’t “reasonable.” I took a job on a [community supported agriculture] CSA farm outside of Madison and loved it, but physically it wasn’t the right choice for me. I transitioned into doing nonprofit and advocacy work, I did marketing on local food campaigns, I started a little catering company that supplied local projects, I managed a community garden—just whatever I could find to cobble together five part time jobs so that I could do the work that I really loved. Through all that, I started to realize that the [farming] community had legal concerns and we didn’t have anywhere to go to find answers. And these are really fundamental, basic questions—business regulation, organization, starting a business, field contracts. All this time I was trying to build markets for farmers to sell into, and I didn’t know if we were building something that could last. Being the “I’ll do it myself” type, I decided to go to law school. Sometimes when you don’t find the answers you want, you have to step up and generate them yourself. Tell me about the process of starting Farm Commons. I had worked with lots of farmers and advocates, so I had those connections going in. During my second year of law school, I had about 30 people read and comment [on my business plan] and help me refine what Farm Commons could look like and what we could do. An Echoing Green fellowship really put me where I am today—that gave me the freedom and flexibility to get this program off the ground. What kinds of unique legal challenges might sustainable farmers face that conventional farmers don’t? I often like to use the lens of community-supported agriculture. I think CSAs have tremendous opportunity to connect rural and urban areas and to provide tangible support and a sustainable income for farmers, but it has a lot of basic issues with it that conventional farmers don’t face. Let’s say a CSA farm hosts a festival at the end of the year and they have 400 people out to the farm. This, in many communities, would be considered a commercial, rather than an agricultural, event, especially if they’re making money. If they invite CSA members to bring friends and relatives who might become members, it’s very important that farms think critically about whether or not to charge. But by [charging], they’re violating the zoning code if they’re in a strict agricultural area. Sales contracts are another issue. Say a farmer and a chef says, “I use so much lettuce. I would love if you would plant some romaine. I’ll buy 30 heads a week.” So the farmer puts in a ton of romaine, and then once the summer rolls around, the chef finds an excuse not to buy the romaine. Could we have prevented this problem with a clear commitment? What about issues beginning farmers face compared to lifelong farmers? Beginning farmers have a lot of issues with trying to access land, though many established farmers also rely on leased land. A lease [can be] a very powerful tool for coming to an understanding of how that land will be used and what that farm experience will be like for both parties. [Beginning farmers] also have a lot to sort out when they’re farming with another individual… How does one partner get out of the business? Plans change—people decide to go back to school or have children and often times when people are starting farm operations they forget to think about that exit. Having an agreement can help a farm carry on past unexpected changes. What has been the response from farmers to Farm Commons? Farmers have been really happy, and that’s really inspiring to me. I think what’s really key about what I do is that I tell stories. I don’t just give a PowerPoint that says, “Here’s the law and here’s what it means.” I start with a story of things that go wrong or missed opportunities or the way farmers confront legal challenges. Stories make knowledge come alive, and it’s a lot of fun for me to try to be able to apply the law to everyday situations. It’s my secret mission to convince farmers that the seemingly boring stuff is actually really thrilling. I love giving workshops where I can turn the farmers loose on each other to resolve some of [the issues they face]. We are not a policy advocacy organization, but what we do is essential to policy. If farmers don’t understand what the law is right now, and especially the basic legal issues that affect their business day to day, then they can’t advocate for what they really want. How would you like to see Farm Commons grow in the coming years? I want to stay responsive. I need to create a forum and put it out there and have it be driven by the farmer community. What I want to see happen is farms that are stable and resilient over the long term. We [also] need a base of attorneys who understand the farm business. We don’t have that right now. Farm Commons at some point will transition away from education…as farmers [are able to] educate themselves and then we can move into developing the attorney community to provide high-quality, affordable services. Knowledge isn’t enough and I need to know that what I’m doing enables a farmer to make practical change on the farm to reduce risk and produce stable, resilient farmers. Many of the farmers have made changes and that’s inspiring to me. Hello, I'm a law graduate who is passionate about farming and would like to contribute to this in any way possible. Please contact me if you're willing. We need help. I am grasping at straws. The City of Mesquite is trying to annex our family farm, Of course they want me to sign a development agreement or be annexed. It feels like blackmail!